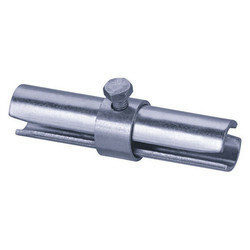 We offer our clients a wide assortment of Joint Pins under this category. These pins are designed and developed by the experts to serve different industrial purposes. Our offered pins are widely used for end to end connection, only when tubes are in compression. Further, we ensure that these pins are delivered at patrons' premises within the scheduled time. Our domain expertise has enabled us to come up with Adjustable Joint Pin. These column clamps are widely used with both steel and timber shuttering. The offered products can be availed by the customers in different specifications in order to meet their diverse requirements. Being a customer-focused organization, we are engaged in offering Scaffolding Joint Pins. These pins are designed and manufactured under the strict supervision of professionals only for compression joints. The offered products provide high strength as these are made using high quality raw material following international standards. These Joint Pins are of great importance for connecting Angle lockers in Scaffolding system, therefore the use of these pins are made to provide support & for High tensile strength.